I’m not very good at staying on schedule am I…oh well, Part II will come soon enough but I want to talk about something else real quick. This has been on my mind recently for art; nothing like digging into folklore to find inspiration. While often shown in stylized representations, the real-life counterpart seems to be a falcon. In my hungarian source in the references, the specific species seems to be the Saker falcon, but in other sources the term Turul seems to refer to cognates that mean vulture, hawk, or eagle. But still, it is some sort of raptor overall, and those in general are known to be symbols of sovereignty in many countries, which does show up in Turul legends. There are two main stories that are repeated in a couple of my sources regarding the importance of Turul in establishing the Magyar people. The first regards the king’s birth. 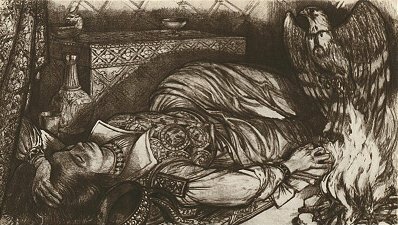 A Hungarian legend tells the story of Emese, wife of Ügyek the descendant of Atilla, who once had a dream in which a Turul appeared to her. In this dream, a crystal-clear stream started to flow from her, and as it moved Westward, it grew into a mighty river. This dream represented her symbolic impregnation by the Turul, and meant that she would give birth to a line of great rulers. Emese later gave birth to Álmos, who was the father of Árpád, the great leader of the Magyars and founder of Hungary. The second story is chronologically later, after Magyars are already established, though the source for it is in Hungarian and google translate isn’t accurate enough to quote it. Basically, the Magyar tribe’s horses are being attacked by eagles, and the people try to drive the eagles away in vain. Up comes the Turul falcon to save the day by killing one eagle and scaring the rest off for good. The attack by the eagles was taken as a sign that the people hand to move elsewhere, and so the Turul lead them to what is now Hungary. Basically, this is a legend that says “hey, this land really does belong to us”, meaning the Pannonian plains. So the turul is both an ancestor (to the Magyars and Huns apparently, since Turul is also Attila’s ancestor) and a guide to his descendents. 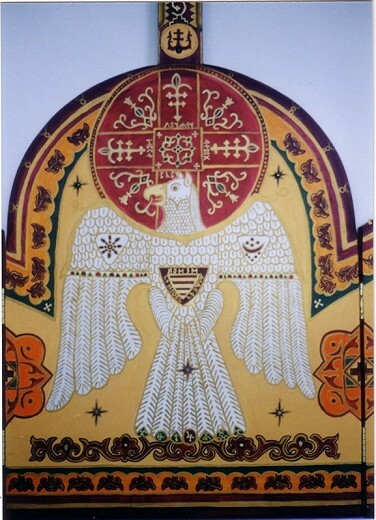 Even today, in heavily Christianized Hungary, it is still a prominent symbol, as well as a source of pride and inspiration, as shown in this modern artist’s interpretation. Turul by Isaszegen, a Hungarian folk artist. Turul is depicted carrying a shield with the stripes of Árpád and holding the moon and sun on his shoulders. He’s said to be the messenger and symbol of the god of the Magyars, but I’ve yet to find a name, description or depiction. Later on the Turul becomes Christianized by being a messenger of the Christian God, delivering a divine sword to Attila the Hun. Personally, I have speculations that the Turul itself is the old Hungarian god, or is at least one of his forms, rather than just being an animal messenger. Of course there’s no way I can back that up so don’t take it too seriously. 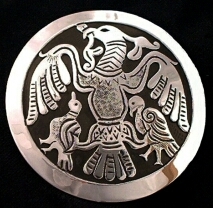 One more speculation is that the Turul, in the assumption that it is a falcon-like bird that was really a significant part of the Huns’ culture, has connections to falconry. In a quick check on the history of the sport it seems that what scanty resources there are points to an origin in Central Asia, which is also the general origin of the Huns. It wouldn’t be too hard to link the scouting behavior of a living falcon with the guide-like behavior of the second Turul story. The Turul has personal significance for me beyond the ancestral one. I’m no linguist, but according to what Wikipedia and the Hungarian source it links to, the term “turul” derives from a Turkic word meaning Peregrine Falcon. I’ve had several close encounters (I mean literally close, as in, only an arm’s distance away from my face) with the peregrine kind while walking home from school. They zoomed right in front of my face and gave a quick display of their awesome acrobatic abilities. I’ve never been so close to such an amazing animal before in the wild, and I’ve had a soft spot for falcons ever since. What’s ironic is that I want to get into parrot rescue, and apparently parrots are most closely related to the falcon family.